Charter member of the Ladies Professional Golf Association, Peggy Kirk Bell also runs one of North Carolina's outstanding golfing resorts at Pine Needles Lodge & Golf Club and Mid-Pines in Pinehurst. Junior Achievement She is a member of the LPGA Hall of Fame. A nationally renowned golf teacher, Peggy Kirk Bell was won the respect of her peers and today's women golfers. 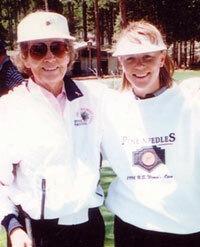 In honor of her career and her outstanding golf facility, the United States Golf Association has awarded the U.S. Women's Open to Pine Needles three times, 1996, 2001 & 2007. When she turned 17 years old, her dad suggested that she take up golf. Lessons gave way to playing in some small tournaments - and Peggy won. She graduated with a degree in education from Rollins College. After World War II had ended, sports began to boom in America. 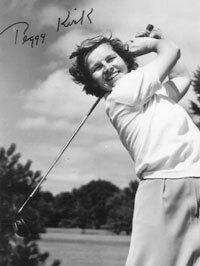 There were a lot of women amateurs playing golf against perhaps the greatest women athlete of the 20th Century - Babe Didrikson Zaharias. The Babe had become perhaps the first woman pro golfer, and she was thinking about a professional tour. 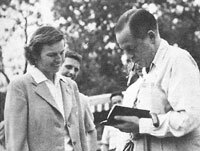 Amateur Peggy Kirk rolled up one victory after another, including the Titleholder's Championship in Augusta, receiving the trophy from legend Bobby Jones. 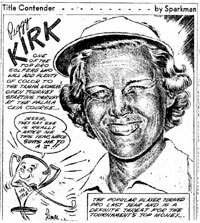 And she won in partnership with the Babe in 1947 at the International Four Ball tournament. Peggy became a charter member of the Ladies Professional Golf Association and barnstormed the United States, England and Australia. Eventually, she turned professional in 1950. 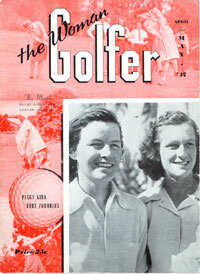 She played on the victorious Curtis Cup team in 1950. In 1953 she married Warren "Bullet" Bell and they bought a share of Pine Needles Lodge & Golf Club  a 1928 course designed by world famous architect Donald Ross. They returned the course to top playing condition. She began a teaching career that included the first women's golf school with legendary teacher Ellen Griffin. She and Bullet began national promotions of their Golfing Safaris, or Golfaris, bringing men and women to Pinehurst and their pioneering golfing schools. Peggy was named Teacher of the Year in 1961. 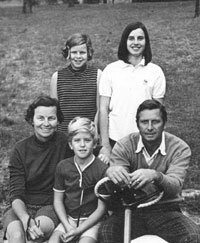 They bought out their partners in Pine Needles, and in 1994 she acquired Mid-Pines Inn & Golf Club  another Donald Ross course. She is an author of two books. She has received numerous major awards, including the USGA's Bob Jones Award. She had been inducted into five Hall of Fames.